If you recall correctly, one of my intentions is to travel to new and exciting places. My last job required me to travel so often, that whenever I had free time, I just wanted to spend it at home. But I have this friend who I would categorize as an International Woman of Mystery. Whenever we connect, I usually begin our conversation with "what country are you in right now? Or "where are you planning to travel next?" This young lady has traveled to many countries including Korea, Japan, Spain, Italy, France, Puerto Rico (multiple times), Columbia, Canada, and has a trip planned to the Dominican Republic in a few weeks. We're not taking into account the countless weekend road trips. I've known the girl since college and I've never once asked her about how she manages to travel so frequently. I always had this perception that visiting other countries would be a strain financially. But I also know that she's is pretty cost conscious. So I invited her to lunch for an interview on any tips she has for us who wish to become world travelers. Ever since she was a little girl, my friend has always had a desire to travel. She remembers watching shows as a child and wanting to explore those for off places. Her venture into the world of travel began years ago with a series of short cruises. While she enjoyed the experience, she felt it a bit too restrictive and wanted the freedom to explore on her own. The very first step she took was to open frequent flyer miles accounts with all of the major airlines. Then she signed up for rewards points with a major hotel (Marriott). She often took weekend trips to the beach ensuring that she always stayed that a Marriott to rack up points. To further leverage points programs, homegirl would use her American Express points to increase her sky miles. This was a big eye opener for me as I hastily have been using my points for hair product purchases on Amazon. If I implemented delayed gratification, I can use my points towards a higher purpose. Between bites, my friend constantly restated how the Law of Attraction plays a huge part in her travels. First, she declares her desired intention to visit a certain country, then she allows everything to fall into place. "I speak it to life.....if I want to go somewhere," she stated with a firm belief. "I said to myself, I want to go to DR (Dominican Republic), and I don't want to pay a dime." A short time later, she receives an email about an inexpensive flight (for which she has enough points). Tack on the free room at the Marriott and she's pretty much set. Intention Manifested. "And when I travel, she says, the hotel usually offers free breakfast and sometimes provides other perks, so I don't spend a lot of money on food and drinks." Perhaps the law of attraction provided her the job opportunity where she took short domestic trips for business reasons. On one occasion, she visited Phoenix for meetings. After realizing that one of the gatherings didn't start until early evening, she arranged to visit the Grand Canyon (a few hours away) and returned back in enough time to attend to business. Once the Phoenix trip was over, she took a quick flight to L.A., for a day or two, then a short cruise to Mexico before returning back home again. In one trip, this girl managed to fit in so much. Meanwhile, all I did on my trips to California was visit a few boutiques. That goes to show you how important the right mindset is. Someone who truly desires to travel will create opportunities from every situation. Another key to her world traveler lifestyle is being known as the girl who loves to travel. For example, her trip to Korea was the result of another friend who travels internationally for work and invited her to tag along. People will often bring up the topic of travel with her which provides the perfect opportunity to offer them the use of her Marriott Rewards number as a friendly gesture. They're happy to enjoy the perks her status, she gets the benefit of more points which means more free stays. 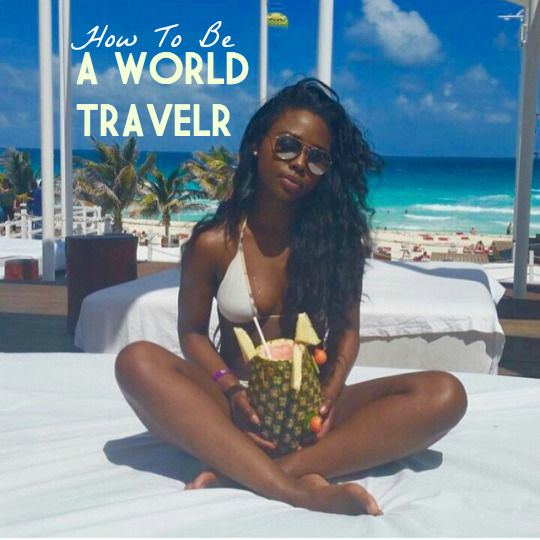 The way she broke down her strategy for how to travel without having to spend a lot of money was eye opening. Once I realized how easy it can be as long as systems are put in place, I became excited about the possibilities. If you have any other tips for world travel on a budget, please share in the comments. http://www.theflightdeal.com/ is a great place for good deals. Your friend is beautiful! Is the picture from Puerto Rico? Another thing that makes Travelling cheaper is to book flights directly with the flight company. And not buy a package. Go during low season. Travelling light can save up to 100 dollar if you dont check in your luggage and only go with what you can Carry on. Pack lunch for the flight. A plane meal can cost anything between 15 and 40 dollar. Bring a Water bottle and have it refilled at a reastairant at the airport, probably get it for free but maybe you Will have to pay a few cents for the service, compared to the average of 2-3 dollar. Small thing you may think but it can save you up to 200 dollar in total. i just love this blog. its so addictive! you just keep scrolling and scrolling and reading and reading and before you know it you're 10 posts in and you haven't left a single comment. Those are fabulous tips. Thank you again for stating what is so obvious that we all fail to forget. Your thoughts create your life. This is off topic but what are her skin care secrets because her skin looks flawless. I have found that if I say which places I want to go to for the year at the beginning of the year I tend to go. Having worked out where I want to go, I look out for cheap air tickets for the shorter trips and use my points for the longer trips. I use discount sites like livingsocial Cudo etc to get deals. I don't have hotel points etc but I do go on accom discount sites as well and I usually get good deals. I have fulfilled my gypsy soul every year by doing this. I do work full time and have a child that goes to school but I have managed to work around it all. Excellent ideas! I've been dying to travel more lately but I've been strapped for cash. Time to start signing up for rewards programs! Very useful post. By your post i got travel tips to save money while traveling. Thanks for Posting.